Raspberry season is the best time of year, is it not? Right now I purchase a flat from a local store, but one of the first things I’m going to do when we move over to Lost Creek Stables is plant a raspberry patch. They are my favorite! This year I had a pint left over after making my annual jam, so I searched for a way to use them. 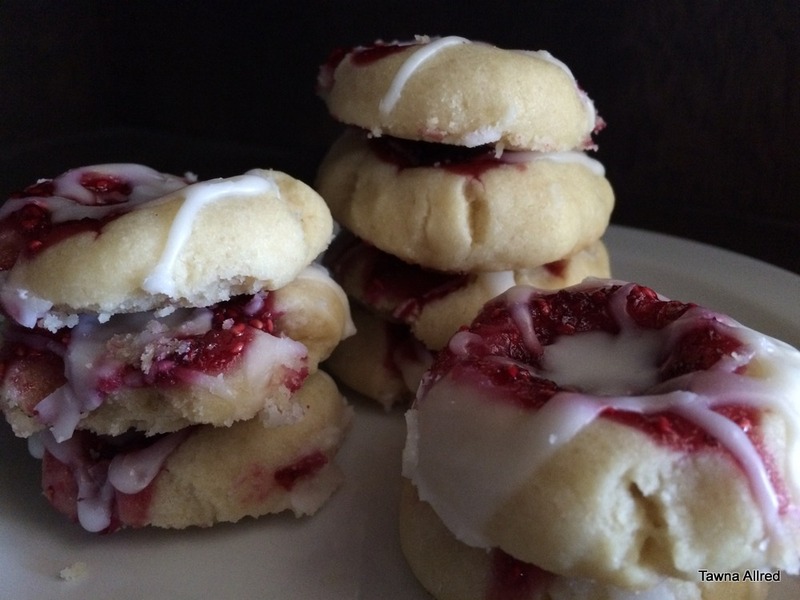 Enter raspberry almond thumbprint cookies. This recipe was all over Pinterest, but I am sharing my own raspberry filling (the recipes I saw all called for jam). This version is WAY better, and it’s not hard, so it’s a win-win. Enjoy! Preheat oven to 350 degrees. In a small bowl, whisk together the flour and salt. Set aside. In a bowl with an electric stand mixer, blend butter and sugar. Mix in almond extract, then add flour blend. In a separate bowl, smash the raspberries down with a potato masher then add sugar. Stir with a whisk until the granules have gone away. Shape dough into 1 inch balls and place on a greased cookie sheet. Press each ball with your thumb, and fill with the raspberry mixture. Bake in preheated oven for 12-16 minutes. While the cookies bake, mix your glaze to your desired consistency. When cookies have cooled completely, drizzle with glaze.